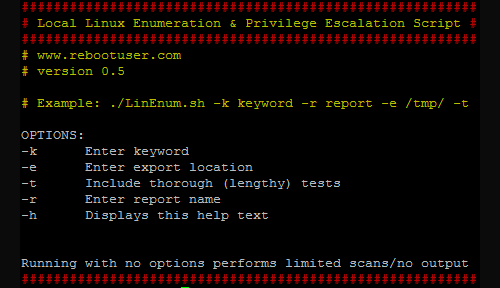 LinEnum will automate many Local Linux Enumeration & Privilege Escalation checks documented in this cheat sheet. It’s a very basic shell script that performs over 65 checks, getting anything from kernel information to locating possible escalation points such as potentially useful SUID/GUID files and Sudo/rhost mis-configurations and more. An additional ‘extra’ feature is that the script will also use a provided keyword to search through *.conf and *.log files. Any matches will be displayed along with the full file path and line number on which the keyword was identified. After the scan has completed (please be aware that it make take some time) you’ll be presented with (possibly quite extensive) output, to which any key findings will be highlighted in yellow with everything else documented under the relevant headings.